By the middle of the 18th century the woollen trade was well-established in Oldham. In the 1790s, mechanized spinning and weaving caused cotton to supplant wool as the main industry. Oldham was a popular place to build cotton mills. Standing on the western slopes of the Pennines, where the damp atmosphere prevented the fibre from drying out and snapping when being spun and woven, six cotton mills had been built in the town by 1778. A branch of the Ashton Canal was completed in 1796 and this helped the local collieries to provide cheap fuel for the steam-powered textile machines. Industrial workers in Oldham played a prominent role in the struggle for the vote. After hearing Major John Cartwright, explain his views on parliamentary reform in 1816, Joseph Healey formed a Hampden Club in the town. Oldham also had a flourishing Female Political Union, and John Tyas of the Times, claimed that 150 women from the organisation attended the meeting in Manchester on 16th August, 1819, that resulting in the Peterloo Massacre. After the passing of the 1832 Reform Act, Oldham elected the two Radical candidates, John Fielden and William Cobbett. By 1838 Oldham had over 213 cotton factories. This was even more than other leading cotton towns such as Manchester (182), Rochdale (117) and Bury (114). The railways also helped the growth of the town. In 1839 a railway between Manchester and Leeds began operating. Three years later the Oldham branch of the Lancashire & Yorkshire Railway was completed. By 1861 the population of the town had reached 72,000. 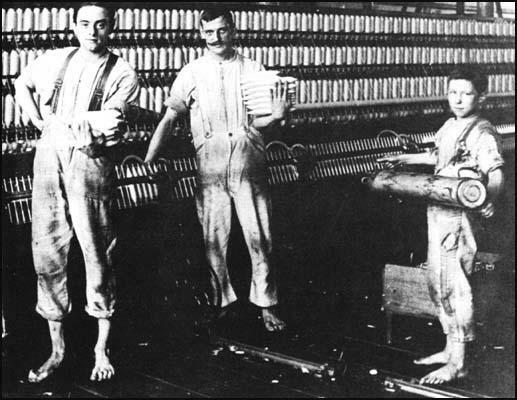 Cotton workers in an Oldham textile mill. (2) In 1892 the twenty-three year old Joseph Clynes was employed by the Gasworkers Union. This resulted in him taking his first ever journey away from Oldham. Millions of men and women died in their own towns and villages without ever having travelled five miles from the spot where they were born. How vividly I remember my first long journey away from Oldham. I had to attend a conference of the Gasworkers Union at Plymouth. To get there entailed a railway journey down the length of England. Men of my own class were driving the engine and acting as porters. I remember a sensation of power as I glimpsed a future in which all these men would be teamed up together with mill-hands, seamen, gas-workers - in fact, Labour everywhere - for the benefit of our own people. The least change of accent in speech, as we stopped at various towns, fascinated me, and I noted varieties of face, dress and manner. That was a wonderful journey for me, who had never before been out of the Lancashire murk. To look through the carriage windows and see grass and bushes that were really green instead of olive, trees that reached confidently up to the sun instead of our stunted things, houses that were mellow red and white and yellow, with warm red roofs, instead of the Lancashire soot and slates, and stretches of landscape in which the eye could not find a single factory chimney belching - this was sheer magic! I began to experience an inexhaustible wonder at the gracious beauties of the world outside factory-land, and this sensation has never wholly left me. That first long railway journey was as wonderful to me as if I had been riding upon the magic carpet in the Arabian Nights. And more and more strongly as I gazed, I felt a sense of indignation that the world should be so generous and so lovely, and yet that men, women and children should be cooped up in a black and exhausted industrial areas like Oldham, merely so that richer men could own thousands of acres of sunlit countryside of whose experience many of the mill-workers hardly ever dreamed.